Jane and Stewart formed Nixon Equine Vets dedicated equine veterinary practice in 2005. Stewart Hastie BVMS MRCVS (Consultant) graduated from Glasgow in 1944. He worked in general practice in Kent & Northampton before joining a one-man agricultural practice here in 1956. He quickly developed a thriving companion animal section (dog & cat in those days) and in the early sixties, began to species specialise in horse work, in which he was fully occupied 10 years later. It was here that Stewart’s pioneering interest in the value of ethical co-operation with recognised complementary disciplines developed. Authoritative, comprehensive and practical, this fully updated and revised edition includes new material on: Laminitis, Equine Metabolic Syndrome, Body Condition Scoring, Biosecurity including Yard Biosecurity plans and National Biosecurity plans; and a brief overview on international horse movements. Also included are sections on Exotic Diseases, Equine Grass Sickness, Atypical Myopathy and an update on RAO (COPD). 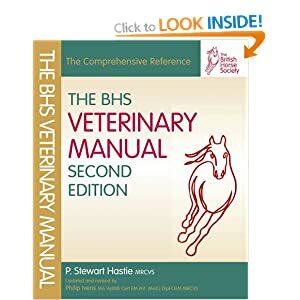 The BHS Veterinary Manual is a companion volume to The BHS Complete Manual of Stable Management and indirectly to The BHS Complete Manual of Equitation. They are intended primarily for examination students but should also be essential reading for all who care about and care for the horse. Share this page on Facebook to be in with a chance of winning a signed copy of Stewart Hastie’s book; the BHS Veterinary Manual which can be purchased on Amazon.